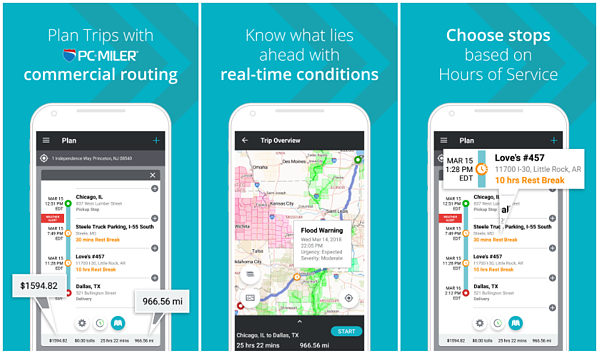 We are excited to announce the launch of our innovative driver trip planning app—MileOn™ by PC*MILER! Powered by ALK’s flagship PC*MILER® routing, mileage and mapping software, MileOn™ by PC*MILER is a much-needed tool for trip planning, scheduling hours of service (HOS) breaks and choosing the right rest stops for your needs while staying DOT compliant. Our new app will help you plan your trip with stops based on your HOS, as well as providing the most practical route with real-time conditions for accurate ETAs. And best of all, MileOn helps you earn more by hitting your delivery windows. What are you waiting for? You can download the app for free today in the Google PlayStore. MileOn by PC*MILER is available for users in both free and paid versions. The paid version of the app includes additional features such as sophisticated HOS planning. To find out more information on features, visit www.mileonapp.com.